Although this slot is steeped in medieval fantasy, the fortune you can win with Rings of Fortune slot game is most definitely real! This jackpot slot is perfect for fans of Lord of the Rings and The Hobbit where you can see this jackpot slot gets some of its inspiration from. Fans of Book of Ra Deluxe, Lucky Lady’s Charm Deluxe and Knight’s Quest will enjoy this slot game immensely. From the moment you load up this game, you’ll be transported to a fantasy, medieval landscape and the castle, the forest and the waterfall in the background will ignite your imagination! What are you waiting for? Rings of Fortune slot game is beautifully-designed; it’s entertaining; it has a jackpot; it has free spins and much, much more! To get a payout in Rings of Fortune slot game, you’ll need to spin at least 2 or 3 matching symbols (depending on the symbol) on consecutive reels from left to right, in a winline of course! Rings of Fortune slot game has 5 reels and 10 winlines. The size of the payout will vary according to your bet and the winning combination. You can change your bet by using the plus and minus symbols to increase and decrease the number of lines you’re betting on as well as the amount you’re betting on each line. The lower-paying symbols are the card values from 9 through to Ace, then there is a harp and a bejewelled brooch, a medieval man and woman, a wizard and the ring of fortune itself! The two special symbols in Rings of Fortune slot game are the wizard and the ring of fortune itself! The ring of fortune is the Scatter symbol, so that means that the ring will pay out wherever it lands on the reels and doesn’t have to fall on a winline. The ring of fortune also triggers free games! During the free games, whenever you spin the other special symbol, the wizard, he will take over the whole reel for the next spin! This is extra handy for you because the wizard is the Wild symbol and his magic powers allow him to substitute for any other symbol except the Scatter. This is not the only reason why the wizard is your best friend – the wizard also helps you get that jackpot! The jackpot in Rings of Fortune is progressive and you’ll see the amount rising with each spin! Fill all of the reels with the wizard and the jackpot will be all yours! Rings of Fortune may be medieval in theme but it’s not medieval in terms of its features! 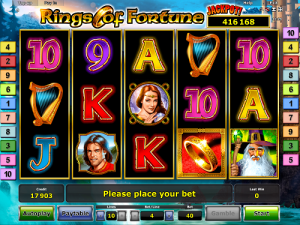 Rings of Fortune slot game has all the modern favourites such as: gamble and autoplay. In Rings of Fortune slot game you can gamble your wins! The gamble feature allows you to heat up the game by giving you the opportunity to double your wins! Try it out and turn the little wins into big wins! You can also put Rings of Fortune slot game into ‘autoplay’ mode and let the reels spin themselves – no more clicking for you! Here at NovomaticCasino.co.uk, we have plenty of other slots, jackpot slots and video slots for you to choose from. We also have a fantastic array of table games and live casino games, including: Sic Bo, Baccarat, Live Baccarat, Royal Crown 3 Card Brag, Poker, Live Poker, Blackjack, Live Blackjack, Roulette, Live Roulette, Multiball Roulette and many, many more! Try them out at NovomaticCasino.co.uk and see if you can find your fortune playing one of these high-quality, lucrative games!